Yes, I’m one of those dog Mom’s that makes sure the pooch gets the best in food, treats, toys and bedding. (On my bed of course). We received a great new dog treat cookbook and decided to give one of the recipes a try. Peanut butter is always a hit with our labrador rescue so that had to be in the mix. 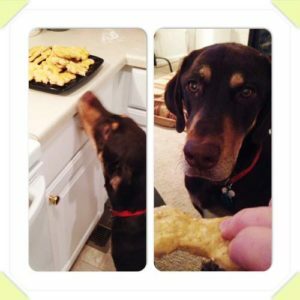 We chose the Sesame Peanut Butter Biscuits recipe only we didn’t have sesame seeds or wheatgerm.. oh well, When I cook for the humans I always just go with what I have in the house and wing it, so that’s the kind of cooking the fur kid gets too. by Janine Adams has more than 50 tasty recipes that your dog will beg for… and they weren’t kidding. They were super simple and seemed to work fine with my substitutions. The baking time depends on whether or not you want a softer biscuit type dog treat or a harder one that the dog can chew on for awhile. I baked these until lightly browned about 12 minutes. To have them be more like a bone consistency cook at a lower temperature until they are very hard. As you can see from the look on Dobby Dogs face.. the effort was worth it, and I believe pretty cost effective. 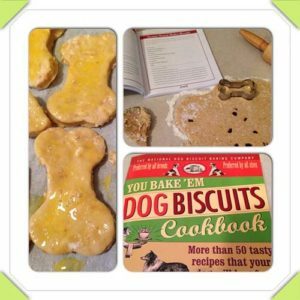 Here are some other options for some bake your own dog treat cookbooks. Note: I have this one too and love it. Sometimes my family is jealous of the “toppings” I make just for the dogs food. Cookie Cutter for only $.88! Gonna have to get that one on my next order!